The impact of Catch Up® in Birmingham! 14th July 2017 - The impact of Catch Up® in Birmingham! Thank you to everyone who joined our lunchtime seminar in Birmingham last Tuesday, to hear about implementing and sustaining high-impact literacy and numeracy interventions. 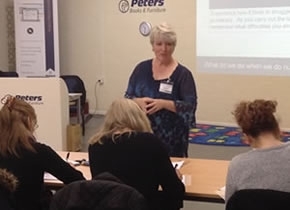 Catch Up® Accredited Trainer, Debbie Rowan, led the seminar. Debbie delivers Catch Up® training to teachers and TAs every term in Birmingham, as well as running our new free follow-up sessions there. We have trained over 450 supporting adults to deliver Catch Up® in Birmingham since we set up our first Regional Training Centre there in 2014! We welcomed back two local schools to talk about their experience of delivering and coordinating Catch Up® Literacy and Numeracy; Jayne Burrows from St Peter’s Catholic Primary School in Walsall, and Mel Fisher from Wheelers Lane Primary School in Birmingham. St Peter’s now have 5 staff members delivering Catch Up®, who have worked with 30 pupils over the last 12 months. They explained that the sustained success of the intervention means the number of pupils being identified as needing the intervention is slowing down across the school. Wheelers Lane currently have 3 members of staff delivering Catch Up® Numeracy to 11 children in years 2, 4 and 6. They have found that all children receiving Catch Up® have made accelerated progress in Maths. The school also started Catch Up® Literacy last year, with 5 members of staff delivering to 18 children. Debbie then ran through the elements of the Catch Up® Training and Support package, including introducing new opportunities available for trained staff, such as the Review and Refresh sessions, Coordinator network meetings and in-depth workshops, and demonstrated the new Progress Reporting Tool, which Catch Up® schools can now use to track and easily report on progress. We hope the seminar was useful for all those involved. Many thanks to all of our presenters and to the schools who came and contributed. If you are in the Birmingham or Walsall area and would like to pose questions to one of our case study schools about their experience of Catch Up®, or if you would like to observe Catch Up in action, please contact training@catchup.org and we will put you in touch with the relevant school contact. Find out more about training and sessions running in Birmingham.